The Stingers wasted no time exploiting their plethora of knock down shooters right out the gate, with five different players draining a three pointer in the opening frame. Notable vets such as Cedrick Coriolan and Schneiders Suffrard were unable to suit up due to injury, however Concordia easily controlled the tempo in the first half with their high intensity and hard nosed defense. Concordia’s backcourt, featuring 6 foot 3 guard Oge Nwogo and senior Ricardo Monge, were a force all game long. Oge recorded 19 points, six rebounds and two assists in 36 minutes of playing time—in what Rastko described as his best game so far in a Stinger uniform. Meanwhile, Monge—who was just two assists shy of a double double—logged 23 points and eight assists, game highs in both categories. “We’re playing with a lot of grit. With the main core together, we know what to expect and the rookies are feeding off our energy,” said Monge after the win. With the team deprived of his services during the first 2 games, 6 foot 7 Forward Michel Hakizimana made his presence felt in his debut and Popovic could not be more pleased. The Stingers outscored their opponents 46-29 in the first two quarters. Nonetheless, with basketball being a game of runs, the Hawks began to claw their way back into the contest in the third quarter. Point guard Bryan Urrutia out of Chihuahua, Mexico led the way for his team. He had 13 points while Forward AJ Cheeseman followed cleaning up the glass with 10 rebounds and scoring 11 points. Trailing all game, the Eastern Shore Hawks managed to get within three points in the fourth quarter with just under five minutes left, but timely buckets down the stretch from all-star Ricardo Monge secured the win for Concordia. Secondary contributions from sophomore Frenchman Mathis Guerut also helped widen the gap as he added 10 points and seven rebounds. The Hawks’ head coach explained that the team had five to six days to practice the style of basketball played here in Canada, however he stated that it is nothing similar to game they’re accustomed to in the States. “These guys play a different style of basketball. It’s a quicker game; 24 second shot clock, a shot reset at 14 seconds after an offensive rebound, so you gotta be able to make quick reads,” he said. He applauds his team for their performance, later complimenting Concordia on the strong victory. “They play different, they’re skilled and they’re tough,” he said. Concordia wraps up their preseason exhibition games against NCAA Division one schools winning two out of three games. Coach Popovic believes the games contribute to the team’s success because they allow staff to analyze, adjust, and experience unprecedented situations during a game. 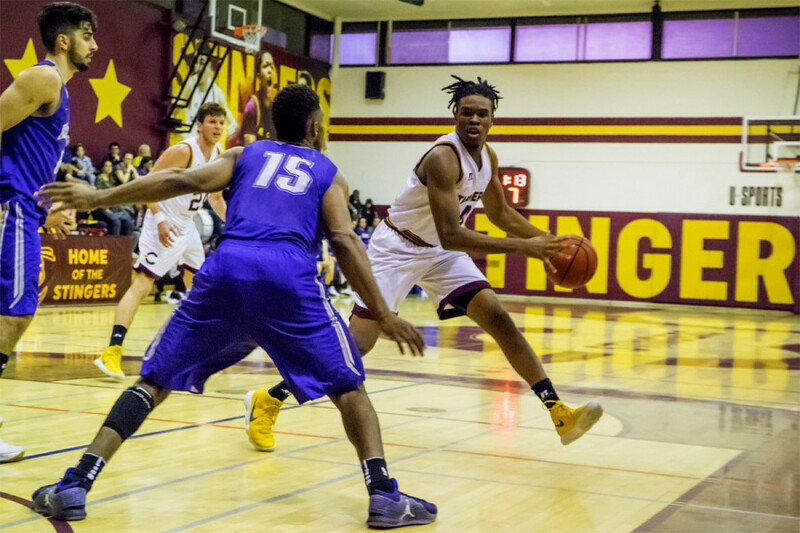 The Stingers will look to build off this momentum going into the Concordia Classic Tournament held in October.